On November 5, Jürgen Habermas will give three masterclasses in Amsterdam for PhD researchers and RMa students from Dutch universities. Further information in my blog post from August 10 here. Ulrich Beck is Professor of Sociology at Ludwig Maximilian University of Munich, Germany. His most recent book is "German Europe" (Polity Press, 2013). German: "Das deutsche Europa" (Suhrkamp Verlag, 2012). Daniel Cohn-Bendit is Co-President of the "European Greens–European Free Alliance" in the European Parliament. Mary Kaldor is Professor of Global Governance at London School of Economics. Paper on "Dworkin on Human Rights"
"This paper critically assesses Ronald Dworkin's theory of human rights in the light of his interpretivist approach. According to this approach, no part of the practice of human rights is a constraint on theory construction unless there is a practice-independent value that makes that relevant. Dworkin's suggestion that the value of legitimacy underpins the practice of human rights is sound, but it explains only part of the current practice of human rights. I argue that the value of legitimacy leaves unexplained the normative concerns raised by treaty-based human rights obligations (such as the ECHR), and that no single moral value can account for the rich and complex practice of human rights." George Letsas is Reader in Philosophy of Law and Human Rights, University College London, and Co-Director of the UCL Institute for Human Rights. On September 29, 2013, Jürgen Habermas receives the Kassel Prize "Das Glas der Vernunft". Habermas is given the prize because of his commitment to a common European future and a cosmopolitical oriented world society. "Der Vorstand und das Kuratorium der Gesellschaft der Freunde und Förderer des Kasseler Bürgerpreises "Das Glas der Vernunft" haben beschlossen, in diesem Jahr Herrn Prof. Dr. mult. Jürgen Habermas mit dem Kasseler Bürgerpreis "Das Glas der Vernunft" zu ehren. Damit soll das wissenschaftliche Werk Habermas' als Philosoph und Soziologe sowie sein Engagement für den Aufbau einer gemeinsamen europäischen Zukunft und die Gestaltung einer kosmopolitisch orientierten Weltgesellschaft gewürdigt werden. In seinen kritischen Beiträgen, leidenschaftlichen Plädoyers, Stellungnahmen und Essays zeigt Habermas eindrucksvoll, wie das Eintreten für eine transnationale Demokratie Hand in Hand geht mit einer präzisen wissenschaftlichen Analyse. Bestimmt von einer skeptischen Hoffnung hat Jürgen Habermas in den Diskurs um eine weltgesellschaftliche Neuorientierung Ratio und Toleranz, Freiheit des Geistes sowie das Bemühen um die Überwindung ideologischer und religiöser Schranken eingebracht. Er hat sich damit in die Tradition der Aufklärung gestellt, der wir uns in Kassel in besonderer Weise verpflichtet fühlen." You can see the prize here. Past prize winners include Hans-Dietrich Genscher, Carl Friedrich Frhr. von Weizsäcker, Yehudi Menuhin, and Ayaan Hirsi Ali. The article is an excerpt from the first chapter of a forthcoming book "Religion Without God", to be published by Harvard University Press later this year. See the three lectures here (videos). The interview covers a broad range of topics from the notions of cooperation and shared intentionality to reasoning and the origins of human communication. Unfortunately, the audio is not in sync with video! - Tomasello's book "Why We Cooperate". Michael Tomasello is an American developmental psychologist, and since 1998 co-director of the Max Planck Institute for Evolutionary Anthropology in Leipzig, Germany. On April 26, Jürgen Habermas will give a lecture at the University of Leuven, Belgium. He will talk about his view on the future of a democratic Europe. The lecture will be introduced by the President of the European Council, Herman Van Rompuy. The lecture will be broadcast live on a large video screen in the Stadspark (city park). This book provides a new theory of democracy and an alternative to contemporary liberalism, in its exploration of the historical and theoretical relationship between democracy and republicanism, and its consequences. 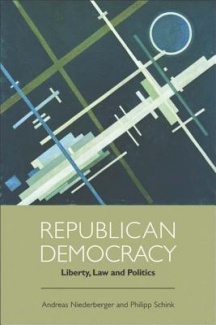 It expands on the foundational principle of republicanism, and puts forward new insights into connections between liberty, law and democratic politics, and a radically new conceptualization of the meaning and structure of democratic institutions and procedures. The book is based on papers presented at a conference on "Republicanism, the Rule of Law, and Democracy" in Frankfurt, March 2009. Andreas Niederberger is Professor of Philosophy at the Johann Wolfgang Goethe-University, Frankfurt. Philipp Schink is Assistant Professor of Philosophy at the Johann Wolfgang Goethe-University, Frankfurt. Thomas Scanlon on "Giving Desert its Due"
Thomas M. Scanlon is Professor of "Natural Religion, Moral Philosophy, and Civil Polity" at the Department of Philosophy at Harvard University. He is the author of "What We Owe to Each Other" (Harvard University Press, 1998). Paper on "New Modes of Pluralist Global Governance"
"New Modes of Pluralist Global Governance"
"This paper describes three modes of pluralist global governance. Mode One refers to the creation and proliferation of comprehensive, integrated international regimes on a variety of issues. Mode Two describes the emergence of diverse forms and sites of cross-national decision making by multiple actors, public and private as well as local, regional and global, forming governance networks and “regime complexes,” including the orchestration of new forms of authority by international actors and organizations. Mode Three, which is the main focus of the paper, describes the gradual institutionalization of practices involving continual updating and revision, open participation, an agreed understanding of goals and practices, and monitoring, including peer review. We call this third mode Global Experimentalist Governance. Experimentalist Governance arises in situations of complex interdependence and pervasive uncertainty about causal relationships. Its practice is illustrated in the paper by three examples: the arrangements devised to protect dolphins from being killed by tuna fishing practices; the UN Convention on the Rights of Persons with Disabilities; and the Montreal Protocol on the Ozone Layer. Experimentalist Governance tends to appear on issues for which governments cannot formulate and enforce comprehensive sets of rules, but which do not involve fundamental disagreements or high politics, and in which civil society is active. The paper shows that instances of Experimentalist Governance are already evident in various global arenas and issue areas, and argues that their significance seems likely to grow." See also a new paper on "A Constitution of Democratic Experimentalism" by Michael Dorf & Charles F. Sabel.